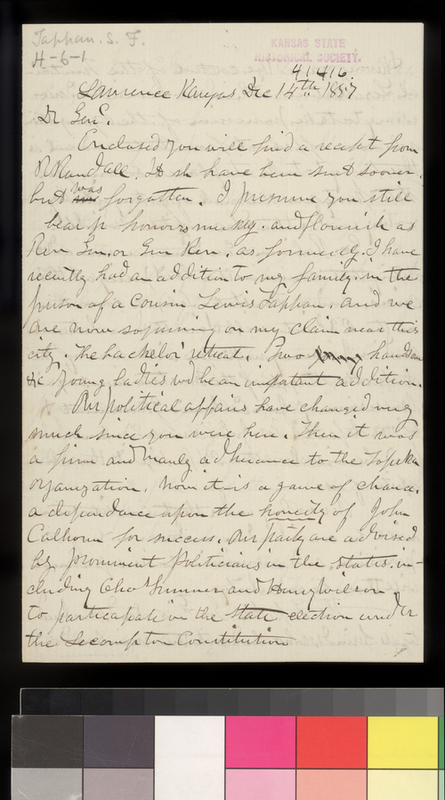 This letter, written from Lawrence, Kansas Territory, by Samuel Tappan, begins with small talk about his personal life. Tappan quickly moves on, however, to the political affairs of the area. Apparently, Charles Robinson and James Lane are encouraging the free state population to vote in the next election regarding the Lecompton Constitution. They are planning on holding a free state convention in a couple of weeks to decide if this is the best course of action. Tappan believes that if free state men vote in the upcoming election, it would be a tacit acceptance of slavery (because proslavery supporters would most likely carry the election, to participate in the election was to legitimize its, possibly, proslavery results). He is also disappointed that the Topeka government has failed, blaming its collapse on the fact that it had been too concerned with weighing "the chances of success in Washington." The free state territorial legislature has just opened its session in Lecompton, Kansas Territory.